The NFL was "freaking out" about Commissioner Roger Goodell attending a Los Angeles Chargers home game with small airplanes allowed to fly above the stadium, according to emails between Federal Aviation Administration investigators and officials. Goodell attended the Oct. 1 game at the StubHub Center in Carson between the Chargers and the Eagles. During the previous two home games, San Diegan Joseph MacRae paid for airplanes to fly above the venue throughout the entire game, with banners critical of Chargers owner Dean Spanos -- one calling him the worst owner in sports. “L.A.’s not a bad place, it's just the Chargers don't belong there," MacRae said. “And my gripe is with Dean Spanos … this is me and Dean Spanos." "The Chargers don't belong in L.A. and everyone knows it, so what better way to keep reminding them of that by having a plane flying over every single home game?" MacRae said. MacRae was allowed to have the planes fly during the game because the FAA didn't believe the StubHub Center was a large enough stadium to qualify for a temporary flight restriction. The restrictions keep planes from flying over an NFL game from one hour before kickoff to one hour after the game, as long as the venue has at least 30,000 seats. The StubHub Center, however, only reported having 27,000 seats, and crowds announced as sellouts don't even draw that many people. "This might be getting blown out of proportion," Ed Stewart, the FAA's law enforcement restriction manager, wrote in an email to colleagues Sept. 29. "Roger Goodell apparently will be in attendance this weekend and the NFL is freaking out that (sic) cannot get a (Temporary Flight Restriction) in place." The NFL and StubHub Center had to prove to the FAA that the stadium actually does hold 30,000 people. They apparently did that in a meeting called a few days before the Oct. 1 game. Officials told the FAA that the Chargers upgraded the venue before the season, expanding the stadium to 30,000 seats, even though they don't sell all of them. An FAA special agent viewed those seating areas a few days before the Oct. 1 game, and agreed, according to the emails. The restriction then went into place. NFL spokesman Brian McCarthy said temporary flight restrictions are an important security element for all NFL stadiums, and that this is a public-safety issue. "The need for the (Temporary Flight Restrictions) have nothing to do with the Commissioner's attendance at a particular game," NFL spokesman Brian McCarthy said in a statement. "It's designed to enhance the safety of all fans at games at NFL stadiums." While the StubHub Center is expandable to 30,000 seats, operator Anschutz Entertainment Group is contractually limited with the state to sell only 27,000, according to the emails, obtained via the Freedom of Information Act. However, officials note exceptions made in the past for MLS playoffs and women's World Cup soccer, which drew more than 30,000. 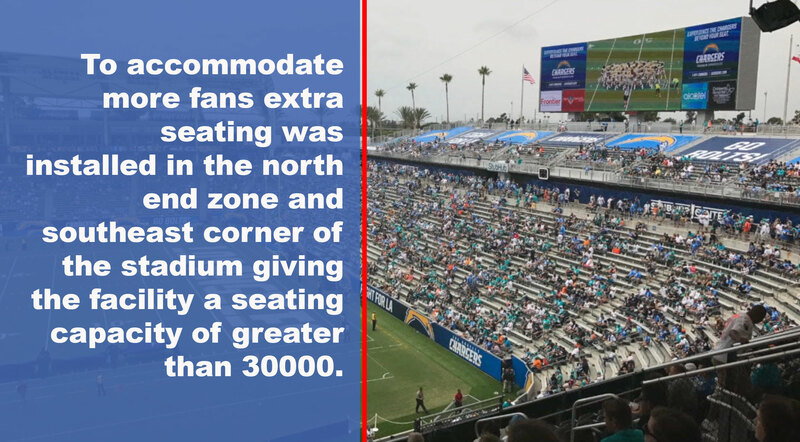 The Chargers say they opted not to sell the extra seats to make sure the fan experience was at its best before letting even more people in, potentially next season. The FAA requested the StubHub Center officially update the capacity on its website to 30,000, otherwise it would put the agency in a "precarious position" when it came to enforcing the flight restriction, one official noted in the emails. MacRae plans to arrange for a banner to fly above Sunday’s Chargers game against the Buffalo Bills, before the restriction goes into effect.